Indian filmmaker Sandhya Daisy Sundaram talks to RIR about the making of her award winning documentary, which was shot in Russia during the peak of winter. A creative documentary by Sandhya Daisy Sundaram won a short film special jury award for non-fiction at the Sundance Film Festival. Her film received accolades for its stunning visuals and an intimate explanation of relationships. The awe-inspiring Russian Winter landscape is the backdrop for this warm portrayal of Russian women and their values of love. The making of this movie took Sundaram on a month-long train ride from Moscow to the Russian North and Siberia in January last year. “I was a part of the Cinetrain project where filmmakers from around the globe set out to make documentaries while travelling through Russia in train,” says Sundaram. “This journey was very important as it brought all of us together and also my first interactions with Russians were while on the train.” Along with a teammate, she covered a distance of 15500 km and visited Moscow, Murmansk, St Petersburg, Kotlas, Tomsk and Khuzhir. “We would stop at a place for a couple of days where we would meet the local women while scouting for stories and characters. We interviewed women of all generations, from young ballerinas to a 101-year old babushka. Earlier I was apprehensive that they might not open up but I found them to be very expressive,” Sundaram says. 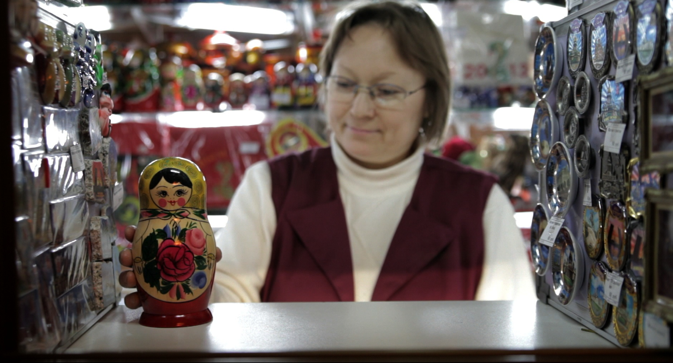 For her this process was similar to the metaphor of the matryoshka dolls which she presents in the trailer of her film. Such warmth on the one hand and the cold weather on the other hand were two extremes of her experience in Russia. “After the first two days I wanted to run back home. In Moscow the temperature was zero, which was not cold according to them, and in Baikal it dropped to -40. I had never experienced this before. However, I did get used to it gradually and thanks to valenki shoes I was soon walking around in snow quite alright,” Sundaram says. When asked if she would like to revisit Russia she affirms enthusiastically – “There was a place in Tomsk which really resonated with me. It was a light bulb factory where a lot of women were working on the assembly line. The setting was visually breathtaking and I told my colleagues that if possible I would like to come back here and shoot it again.” Sundaram is ready with her next story idea for a Russian film. She is equally prepared with a formula to survive the Russian winters that is, besides vodka and valenki, love.